Sometimes in astronomy a weird idea can actually pan out. Suppose you have a neutron star that is absorbed by a red giant. Maybe the two happened to have a chance collision. 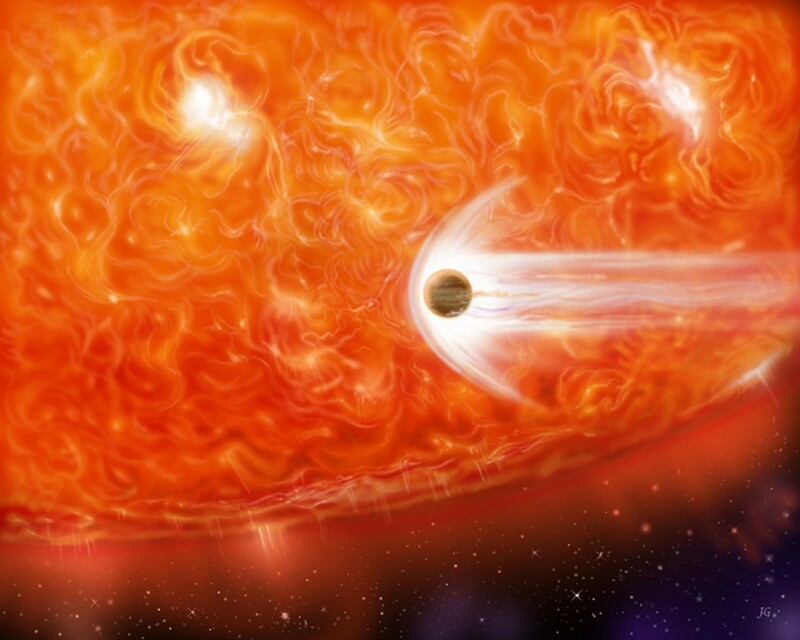 More likely the neutron star was a close binary with a regular star, and as the star died it swelled to a red giant which engulfed the neutron star. What would happen? Back in the 1970s Kip Thorne and Anna Zytkow studied this hypothetical object, which is why they are now known as Thorne-Zytkow objects, or TZOs. A neutron star is only about 15 kilometers wide, but are as dense as the nuclei of atoms, and can be as hot as the core of large stars. An isolated neutron star cannot fuse elements, but a neutron star in the center of a red giant could heat and compress the center of the star to the point where it could fuse elements. The idea was proposed as an explanation for some of the more exotic types of stars such as R Coronae Borealis variables, which typically has a slight variation in brightness, but can occasionally dim by several magnitudes before brightening again. It’s an interesting idea, but it would seem highly unlikely that such a hybrid star could form. But an upcoming paper in the MNRAS Letters may actually have found one. The team did a survey of 22 red giant stars, and one of them, known as HV 2112, stood out because of its unusual spectrum. Specifically, its spectrum showed much higher levels of molybdenum, lithium and rubidium. Any one of these could be explained by various mechanisms that can occur in a red giant, but to see all three is highly unusual. It is, however, the type of thing you might see in a TZO. That’s because a TZO would fuse these types of elements near its core, which would then be carried up to the surface by convection. Just to be clear, this is not a smoking-gun for Thorne-Zytkow objects. HV 2112 looks like a typical red giant beyond its unusual spectrum, so it’s possible that some other mechanism is the cause. It will take more data and more study of the theory behind TZOs to be sure. But if this is a TZO, it could change the way we understand element production in the universe. A TZO would be another mechanism for creating heavier elements.